VR cinema at BIFF a glimpse into future? BUSAN -- Many kids have dreamed of jumping into their favorite cartoon and being part of it, and virtual reality cinema is as close as you’re likely to get with today’s technology. The VR Theater section at the ongoing Busan International Film Festival offers a peek at what may be the next step for cinema and entertainment in general. The section is divided into three parts: VR Movie, VR Movie Live and VR Movie Experience. VR Movie works like your standard cinema, where audience members sit down and watch a designated short film that is up to 40 minutes long. VR Movie Live allows you to watch various short films for 30 minutes, while VR Movie Experience offers VR films with interactive elements. To watch the VR films, you wear a VR headset that gives you a 360-degree field of view with surround sound. A VR version of Korean zombie film “Train to Busan” is one of the features at BIFF Asian Film Market, available through Tuesday. The most striking thing about VR cinema is the immersive experience, such as in an episode of “The Tide,” a horror cartoon about a gigantic mutant fish taking over the world. While the story was familiar, it was something else to actually be in the water with a school of 3-meter tuna. Just the sense that something may pop up literally right next to you offers a whole new aspect on the cinematic experience, especially in horror genres. Although the immersive experience and interactive fun are definite upsides, there are still many obstacles to overcome before VR cinema fully hits the mainstream. The most glaring problem is cost. The 360-degree field of view is provided by multiple cameras and lenses, with the images “stitched together.” The Hollywood Reporter recently reported that companies charge some $10,000 per finished minute for the process, and that’s just for putting the filmed images together. High-end computers and cameras are also required, and VR headsets like the Oculus Rift cost $399. From a cinema perspective, it is unclear how the director’s camerawork and editing skills will be applied in the 3D environment. If the traditional cinema had the audience following the perspective of the director, VR provides each audience member with his or her own perspective. Of course, there’s the obvious problems of the VR experience not being physically comfortable. The headsets currently available are huge, and can be a literal pain in the neck. Those susceptible to nausea can also feel dizzy just minutes into seeing the 3D videos right in front of their eyes. Nevertheless, it is a new frontier worth pioneering. 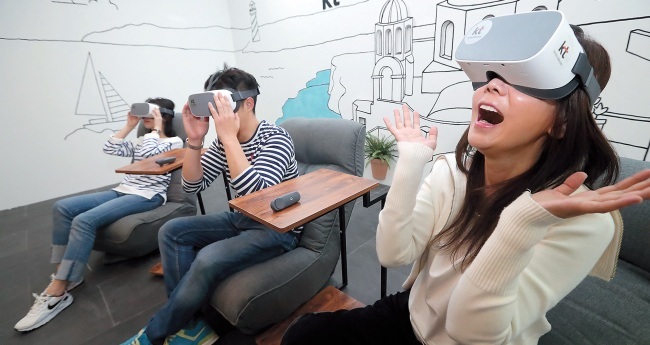 Authorities have taken notice of virtual reality’s potential and the Korea Creative Content Agency has set aside a budget of 11.9 billion won ($10.5 million) to finance such content. It financed the production of 16 VR films in 2016 and 19 last year. Last year’s joint report by the Korean Agency for Technology and Standards, Korea Electronics Association and Korea Institute for Advancement of Technology on rising new industries pegged the market for virtual and augmented reality technology at 83.1 billion won in 2015, with projected growth to 171.3 billion won by the end of 2018. The VR Theater section will run at the Busan Cinema Center until Friday, from 10 a.m. to 6 p.m. The 23rd annual BIFF closes its curtains Saturday.